The roof of the home of former Russian spy Sergei Skripal is to be dismantled by military teams in the wake of the Novichok attack. Detectives believe Mr Skripal and his daughter Yulia first came into contact with the poison when it was sprayed on the property's door handle. The replacement of the roof timbers is a "precautionary measure". It will ensure there is no chance of residue contamination from police searches, say Wiltshire Council. The clean-up at Christie Miller Road, Salisbury, has been taking place ever since they collapsed on 4 March. The authority has warned neighbours of about four months of disruptions as it replaces the roof timbers. Speaking to BBC Radio Wiltshire, Alistair Cunningham, the chair of the recovery coordination group, said: "the whole house had to be searched, including the roof space. We want to be sure no contamination was taken from the door into the roof space. It's a timber structure and when it comes to wood it's more difficult to clean. It's easier to remove." Contractors will cover the house and garage with a "sealed frame", according to a letter written by the council's director of public of health, Tracy Daszkiewicz. A military team will then dismantle and remove the timbers, before removing them from the site. She said the risk to public health remains "low". Image caption Contractors will cover the Skripal's house and garage with a "sealed frame"
Mr Cunningham confirmed that the house is still privately owned by Sergei Skripal but that he had not yet made clear whether he wishes to return. The council, he said, would be ready to purchase the house if Mr Skripal decided to sell it: "Our concern is that if this house were sold, that it should be sold for the right reasons, i.e. this is a family home and should remain a family home. "We have the ability to purchase the property, if it's in the wider public interest to do so." 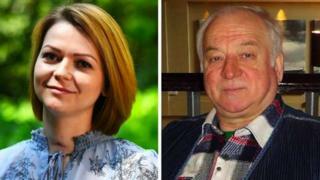 Mr Skripal, 67, and his daughter - who was 33 years old at the time of the attack - survived the attack which Prime Minister Theresa May said had "almost certainly" been approved by the Russian state. The Salisbury poisoning: What happened next? The two suspects - known by their aliases Alexander Petrov and Ruslan Boshirov - were caught on CCTV in Salisbury the day before the attack. The Skripals and the Salisbury poisoning: What happened next? Video Russian spy poisoning: Why was Sergei Skripal attacked?